There are many string trimmer lines to pick from today, with each offering its own benefits and drawbacks. If you’re unsure on what string trimmer line you need, well you’ve come to the right place. Today I’m going to go over 5 different types of trimmer lines, and by the end of it, you should know which one you need. Before I discuss the actual trimmer lines, I’ll give an overview of what size diameter you’ll need. Smaller to medium size weeds you’ll be fine using a line that has the diameter size of .60 – .80 inches. This will be for your smaller jobs around the house, your front lawn and whacking the weeds from your driveway and small residential areas. Medium size weeds you’d want to opt for a line around 0.80 – 0.110 inches in diameter. This sizing is ideal for your bigger gardens where you have slightly bigger weeds, this size of line commercial areas too. Dealing with large weeds you’ll want anything from .115+ inches and bigger. Places of work that need a large amount of trimming, such as large estates, huge gardens, and industrial areas of landscaping, this should be your weapon of choice. Pro tip – Before you go and buy a string trimmer line, check your string trimmer to see what it is capable of holding, as most can only go handle a certain size. Refer to the product handbook if you’re unsure. Okay, now let’s get onto the actual lines. A square design as the name hints is a square line. This type of design makes it perfect to cut down the heavy weeds. Its’ big, it’s thick (that’s what she said), and it will knock down anything you put in front of it. 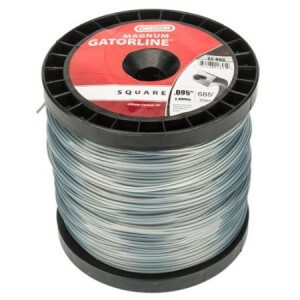 My recommendation for your square design string trimmer line would be the Oregon 22-895 priced at $35, with free shipping. 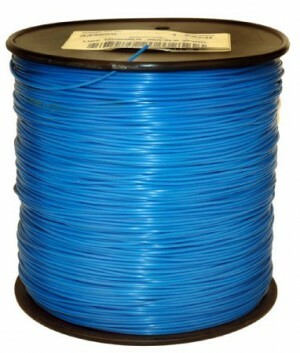 It comes in at 0.95 inches in diameter, has been specially designed to prevent the outer layers from welding so easily, and the spool is 685 feet long. You can knock this line against rocks and trees and it will come out fine. Spiral shaped lines work best with electric and battery powered string trimmers as they are much quieter than there gas powered brother. The Lonoiz LN130DLG-12 is a .130 inch commercial grade spiral line that can take on the heaver jobs, priced at $17. This spiral string used an advanced spiral design to give the user a cleaner cut, and works well on heavier foliage. I managed to hit the pavement a few times and the even the edges of the road using this string, and it never split or broke off like other spiral lines I’ve used in the past. The rounded shaped trimmer lines are for everyday home use, there is not job too small for the rounded line. This type of line is generally lasts a lot longer if you use it for the smaller stuff, tends to be the cheapest and easiest to line to replace. 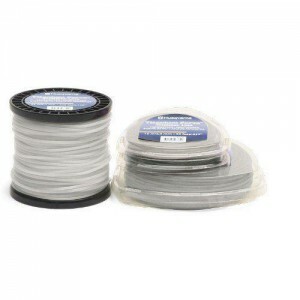 Maxpower 333665 is a 0.65inch round shaped line that is made from nylon. Providing you with 1800 foot of line, for $21.99, it’s a steal. After making this purchase, you and your future generations won’t ever have to buy another rounded shape line, that’s how durable the Maxpower 333665 line is. Best for: Small residential jobs and personal use around the house. This 6-blade string trimmer line is for the landscaping professional, and made to stick on the end of high-wheel trimmers. The ribbed like design is to increase the ability to cut through weeds and big grassy areas, with no dramas. 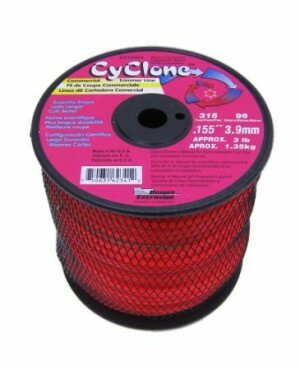 Cyclone provides their CY155S3 6-blade line which is 0.155inch, for only $29.99 with free shipping. Made using copolymer nylon ensuring durability, if you need something that throws rocks about and has a never say no attitude, this bad boy is for you. With a 315 foot line, it won’t ever need replacing. 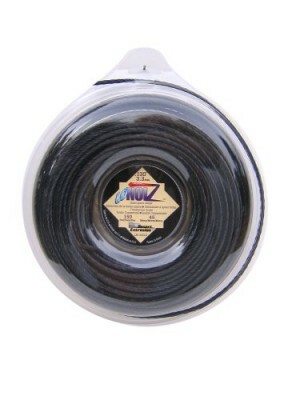 Best for: Heavy duty work and professional landscapers wanting a long lasting line. Husqvarna have produced the 639005106 titanium trimmer line, coming in at 0.95 inches at just $31.91, with free shipping. Using this line for medium size jobs was fine, I didn’t incur any problems and even hit my steel fence a few times, with the titanium line coming out undamaged. The thing I love most about this line is that it can provide high quality trimming at low revs. Best for: Medium size jobs where you require a professional finish, great for landscapers and residential use. So there you have it, a brief overview of various types string trimmer lines and what they’re best for. You could go ahead and buy the thickest line you can find and use that for everything, but you don’t take a grenade launcher into a knife fight do you? It’s important to find the right line for the right job, to get the right finish on the property you’re working on. We are trimmer line packaging equipment manufacturers.We offer a variety of trimmer line packaging equipment such as blister packing machine, automatic bundling machine, trimmer head winding machine, trimmer line spool winding machine, etc. Xiamen HiTech Automation Technology Co., Ltd.